ITV viewers were treated to a slice of Street Child World Cup fun this week when analyst and pundit Patrick Vieira introduced footage of himself and Italian legend Fabio Cannavaro taking sides in a Team Brazil girls friendly match on the beach in Rio. The World Cup winners had been so impressed by a Street Child World Cup exhibition that they have become supporters of the organisation and had promised a game against Team Brazil girls – World Cup winners themselves of course. The girls from the Favela Street project have gone from strength to strength as a team since being crowned champions in April. 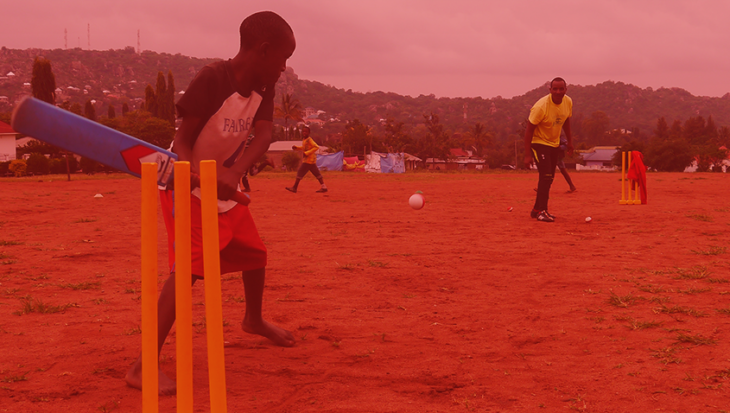 The project not only support them on the field but also in giving them life skills in areas like education, health and their future careers. Ahead of the game Coach Philip Veldhuis led the group in discussing what it means to be part of a winning team and how to be Ambassadors both on and off the pitch. Vieira and Cannavaro discussed what leadership meant to them and they were then presented with the much sort after SCWC jersey. They then took to the field lining up against one another in a repeat of the 2006 FIFA World Cup final between France and Italy. Once again we were reminded of the power of football to give vulnerable and at risk children a safe platform to not only play and be children but also to remind the world of the potential of every child regardless of their background. With thanks to the Cesar Park managed by Sofitel, Jamillah Van der Hulst and the Street Child World Cup exhibition sponsored by Cordaid, Virupa and Vink.